← Kingscliff Design Logo – HELP!!! This time I will be showing you the CD packaging and the wine labeling, the CD packaging was left up to us what music we decided to feature on the CD and to work the style of packaging design around the style of music. This would be how it would happen in the real world anyway, I suppose. I chose to make mine for jazz music, modern jazz but with a smokey feel and I spent quite a bit of time on the internet listening to jazz music to get just the right feel for the cover and graphics. Eventually I landed on a theme and knew what I was doing. I created a concertina fold for the case and a small poster for the center with the details of the tracks on it, then the CD design itself. I was happy. The wine labels also took quite a bit of sampling, I needed to find just the right bottle, I knew I wanted a frosted cool looking bottle for the white wine and a stouter bottle for the red. The white was my main concern and it did take a lot of walking around bottle shops looking at wine bottles before I landed the one I liked. 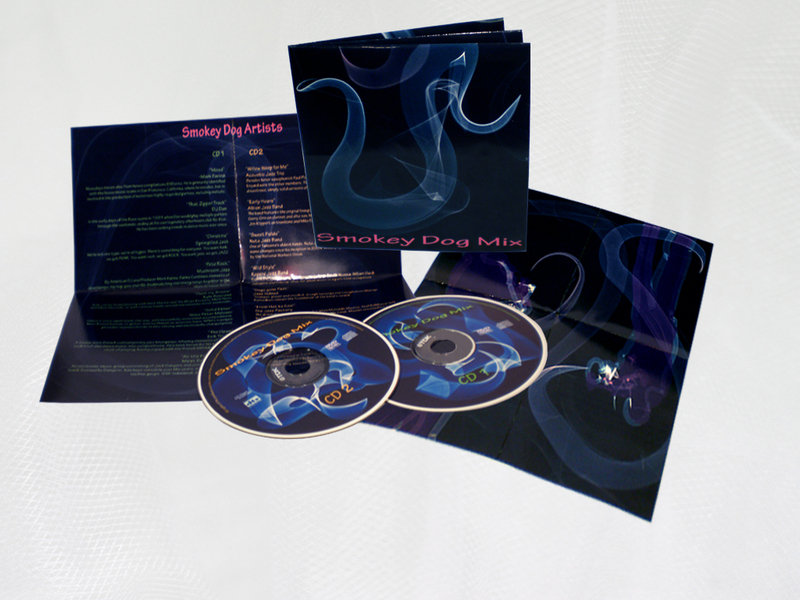 The CD case, I named my CD ‘Smokey Dog Mix’ and using a deep navy blue background created a few brushes using Photoshop in the form of smoke. The concertina folded case allowed for two CD’s and a slot in the middle for the information sheet. It is easily recognisable and unforgettable, I kept the smokey theme going through to the CD’s themselves, which turned out stunning. The wine bottle labeling and packaging was for a brand named ‘Atlantis’ and, keeping with the theme of the name I gave the whole set a deep-sea feeling. 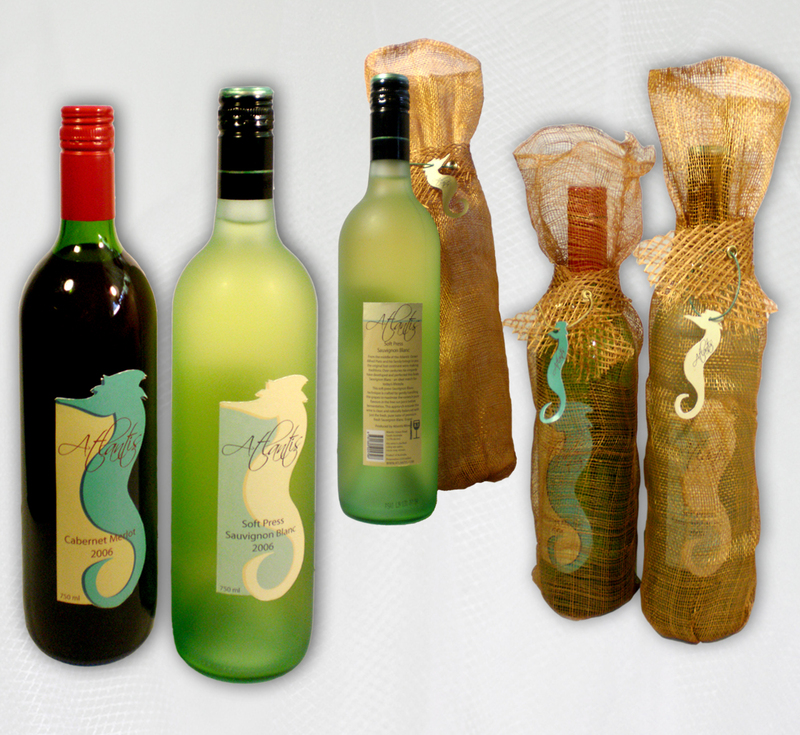 The packages are made out of woven sea-grass and the label fronts are die-cut in a seahorse shape on one side. There is even little gift tags which attach around the neck to hold the casing on snuggly. The colour pallet is representing the ocean, with the soft sandy tones of shells and sand combined with the mystical blues and aquas of the deepest still water, and the fishes. The fonts are both flowing and steadfast in the appropriate places. Really love the smokey look on the cd Robyn! As for the wine bottle, I like the light green wine bottle the most! lovely woven sea grass also!